Martin Cruz Smith takes a break from his long running Arkady Renko Russian crime series which started with Gorky Park to explore a different corner of history. The Girl from Venice takes readers to Italy in the dying days of the Second World War. Italy is being bombed by the allies and is riven by division as Mussolini and the fascists cling on to power. At the same time the country is playing host to the German Western Front command and an increasingly desperate German army, many of whom can see the writing on the wall. But the focus of the novel is Innocenzo, or Cenzo, a fisherman of Pallesteria, a small town across the lagoon from Venice. When Cenzo picks up what he thinks to be a dead girl floating in the lagoon he steps into a world of trouble. The girl, Gulia, very much alive, has escaped from a German attack that killed her Jewish family and the two end up in the middle of a number of power plays as various people try to manoeuvre as the war ends. Chief among these is Cenzo’s brother, a famous actor and propagandist for the Mussolini regime. 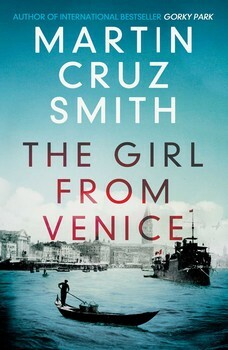 In The Girl From Venice, Cruz Smith effectively captures a point in time. In particular the chaos that accompanied the slow withdrawal of the Germans from Italy. The scenes in Salo as the American army advances, the German army crumbles and the Italians try to work out which side to bet on are particularly fascinating. All this sits in the background to the plot itself, part family drama, part mystery and part romance that keeps the whole ticking along. So that while he falls back on familiar character tropes, Cruz Smith delivers an engaging and fascinating historical drama.